Good Morning Messages for Boyfriend: Send a sweet text to your guy to wish him a good morning. Follow it up by posting cute quotes on his Facebook and Pinterest. Tag him in a funny tweet to let him know that you are thinking about him. While these things might seem lame and mushy right now, they will go on to become priceless memories of your relationship which you will cherish years down the line. From Missing Yous to I Love Yous, don’t let a single morning go by without exchanging romantic banter while you both are still snuggled cozily in your blankets. His virtual hugs and kisses will be all you need to smile and your flirty texts are all he will need to feel good about the day that lies ahead. 1) I don’t know what is more romantic – the thought of meeting you soon or the dream I had about you last night. Good morning. 2) I dream about you while rolling around in bed, remembering all the romantic things you’ve said. I think about you, with every breath I take… baby you are the icing on my life’s cake. Good morning. 4) You have replaced my nightmares with dreams, my worries with happiness and my fears with love. Good morning. 5) It doesn’t matter if I have a coffee or tea. I will feel the same… as long as I know that you are thinking about me. Good morning. 6) The warmth of every single ray of the sunshine reminds me that we were just meant to be. Good morning. 7) Your warmth envelops me tight, your affection makes everything right. Your company puts me on cloud nine, your presence makes everything fine. Your eyes show me the way, your heart beat guides me night and day. Good morning. 8) Mornings are the loneliest part of the day because that is when I need you the most to give me warm hugs and cute cuddles. I miss you, good morning. 9) My pillow hates you because it knows that I would trade it for your warm shoulder any day. Good morning. 10) Good morning… to the guy whose hugs make my days sweeter and kisses make my life brighter. 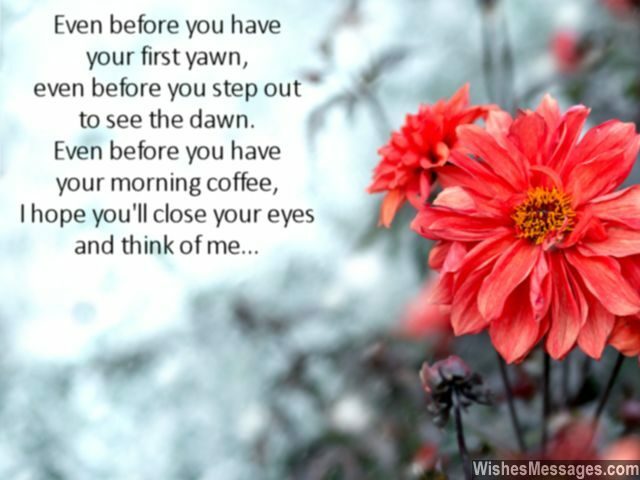 11) Even before you have your first yawn, even before you step out to see the dawn. Even before you have your morning coffee, I hope you’ll close your eyes and think of me. Good morning. 12) I was looking for something to keep me warm this chilly morning… so I thought of you. Good morning. 13) I wish I could say this to you, face to face. I wish I was right there beside you, at your place. I wish I could look deep into, your eyes and gaze. I wish we were together right now, to embrace our love’s blaze. Good morning. 14) Gazing outside the window and thinking about you while I sip my morning coffee is the best part of my day. Good morning handsome. 15) Even the most profound quote about love can’t do justice to the bond between you and me… because we both have been brought together not by chance, but by destiny. Good morning. 16) As the morning sunrise creeps through the blinds, being with you is the only thing on my mind. I love you. 17) I woke up with a sweat… not because the morning was too hot to handle, but because my dreams about you were too hot to handle. I miss you, good morning. 18) I hate the fact that I have to, send a good morning text to you. I wish I could be with you night and day… so I can love you silly in every possible way. But you are so far, over there. This distance I can no longer bear. Yet again as a new day starts, I say I Love You with all my heart. Muah. 19) Happy thoughts are the only cure for a sleepy morning… and I feel the happiest when I think about you. Good morning. 20) Were you a coffee bean in your past life? Must be, because I can’t start my day without you. Good morning my love. 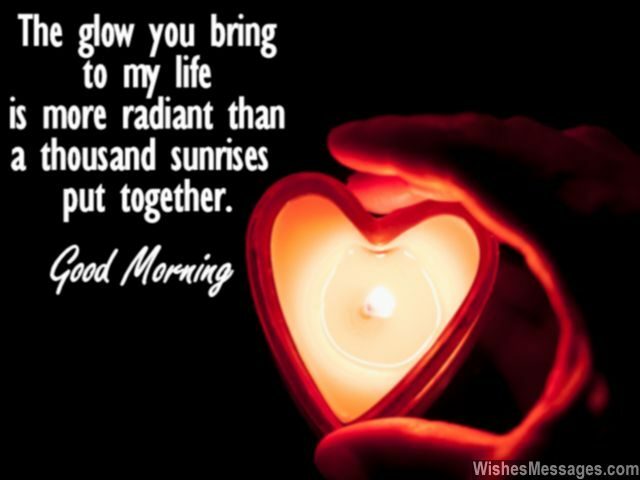 21) The glow you bring to my life is more radiant than a thousand sunrises put together. Good morning. 22) May a handsome guy like you have a day, as beautiful as a girl like me. Good morning. 23) Wishing a good morning to the person who is the reason why I feel like waking up every day. I love you. 24) I love the sun because every time it comes up in the morning, it gives me yet another day to spend with you – the guy I dream about at night. Good morning. 25) Some girls just dream about having a boyfriend as handsome and caring as you. I dream about it too… but the difference is that I am living my dream every single day. Good morning. 26) You are my sweetest dream come true. Good morning. 28) It doesn’t matter whether today is Monday, Wednesday or Sunday. As long as are together, it will always be a beautiful day. Good morning. 29) I wish I could just come over, run my fingers through your hair and give you a soft kiss to wake you up. Good morning. 30) Dates in the calendar change every day, but the fact that you have been my hottest date ever, will never change. Good morning. 31) I was smiling all night long, because I was dreaming about you. This morning too, is drenched with our love’s dreamy hues. Good morning. 32) I am waking up to the morning sunshine and thinking about how awesome it would be… if only you were right here beside me. Good morning. 33) Every day in my life is perfect because it starts by wishing you good morning. Muah. 35) I want to live in the present but I am always caught up dreaming about either the past or the future… the beautiful memories that we have shared or the happy times that lie ahead. Good morning. 36) Your hugs and kisses are the only sunshine I need… Good morning. 37) Other girls wear makeup every morning to feel confident about themselves. All I do… is think about you. Good morning, I love you. 38) Your morning coffee will be made perfect, with a teaspoon of my love and a pinch of my hugs. Good morning. 39) Even the surreal colors of the early morning sky aren’t as dreamy… as the kisses you give me. Good morning. 40) lYour hugs are the reason for my happiness, baby you make my life priceless. Good morning.